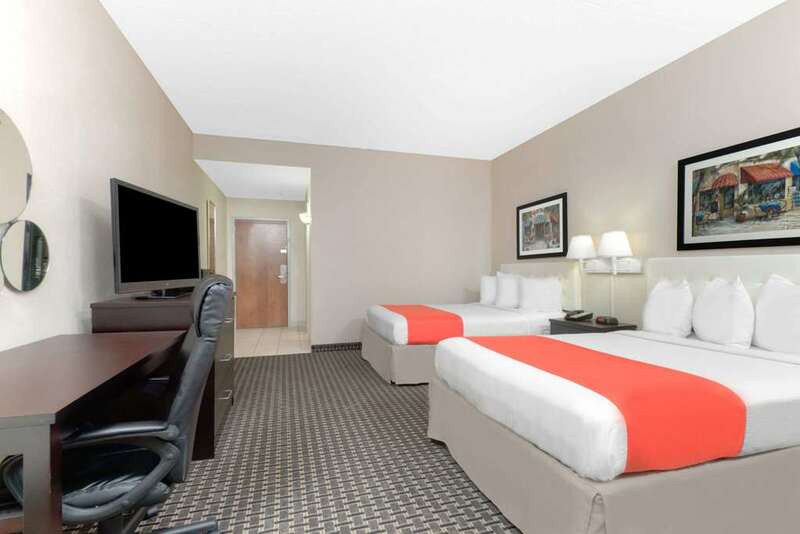 Find fun for the whole family at this Howard Johnson Inn Lima conveniently located off Interstate 75 just one mile from the Allen Country Fairgrounds. Learn about the moon at Armstrong Air and Space Museum, or head to Indian Lake for fishing and boating. Ohio State University and Ohio Northern University are both nearby. After an exciting day, enjoy a meal onsite at The Pizza Lounge. Start your day with a complimentary Rise and Dine hot breakfast and connect to complimentary wireless Internet access to plan your day. Energize in the fitness center, and relax in the heated indoor pool. Host your next social or business event in the meeting and banquet facilities accommodating up to 300 people, and a business center is available for your convenience. Unwind in your comfortable guest room watching the 42-inch HDTV, or upgrade to a hot tub suite for additional comfort. Smoke-free and handicapped-accessible rooms are also available. Pets are welcome at this lodging. Guests must be 21 to check in.